South. West. Trains. That was it. The extent of the brief, from a lovely repeat customer, who ‘trusted me 100%’…. Crumbs…. I googled and found a colour scheme. But I was really concerned that a cake with a train on top, would instantly look like a kids cake. And I knew I wanted to make Steve, and in my vision(! ), he was perched on the edge of the cake, red lanyard and all! The advantage of doing this, was that he didn’t need to be the same scale as the train, or just in the window. And standing too close to the track would imply a train-based problem …. He he, I sometimes take this all a bit too seriously ….! I knew I wanted the train to be bigger than the cake size would allow a full train and carriages to be, so suddenly I saw it coming out of a tunnel. 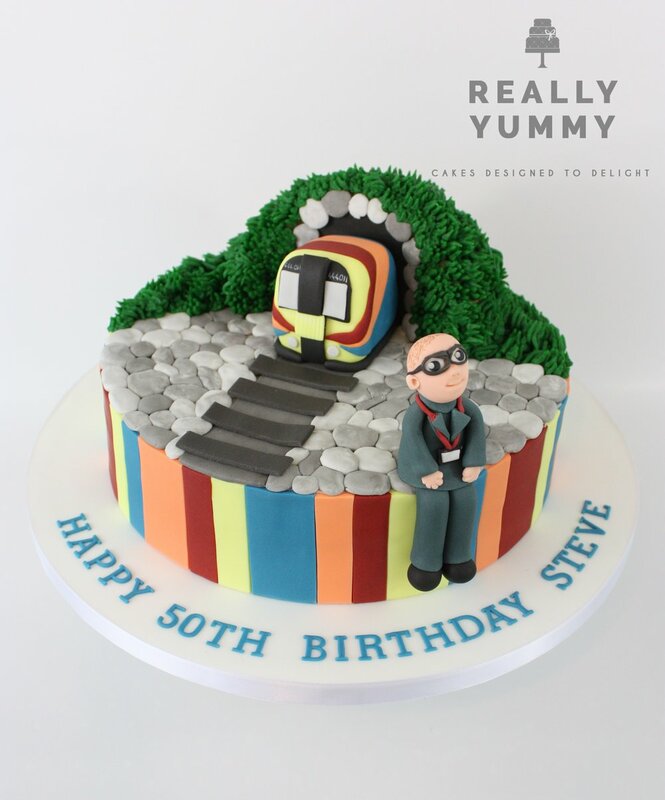 No need to make room for the rest of the train, and Steve could take his rightful place at the front of the cake. I’d done a striped cake in the same week, and the train colours were all ready to go, sitting there next to it. They looked fabulous together, so I decided to stripe them around the edge, to strengthen the scheme. The tunnel – I could see the tunnel in Chitty Chitty Bang Bang in my head as I modelled this! I knew that tunnel edges needed to come forwards as well as out to the sides to look realistic. And they were generally grassy, bushy areas. And the cobbles came to me very last-minute. I was looking for a surface that Steve could sit on securely, but also one that would look right next to the tracks and up against the grass. Cobbles! So there you have it. The meandering story of this cake design. And a small window into the workings of my mind….